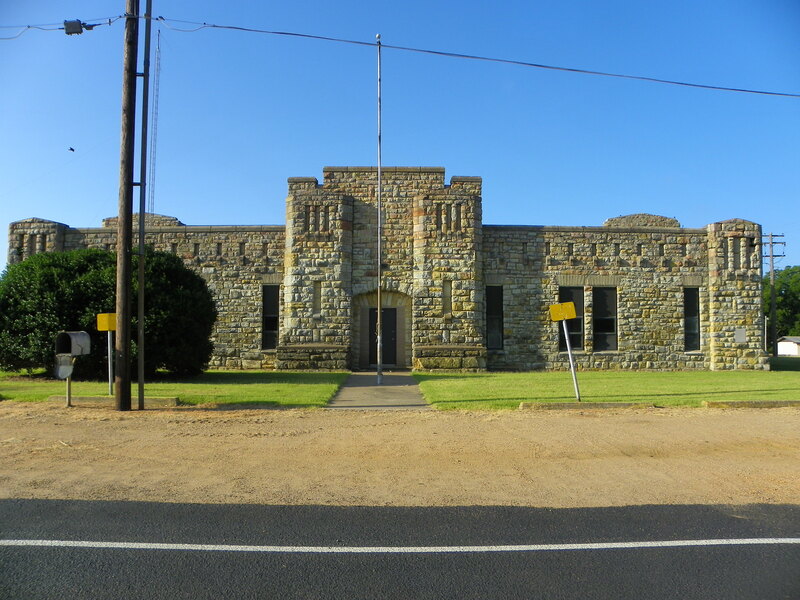 The Tishomingo Armory is a single-story rectangular structure constructed of rusticated and coursed native sandstone. The 140′ x 126′ building consists of a drill floor with an arched roof and parapets, and a wing on the north side with a flat roof and parapets. The main entry, recessed behind an archway, is framed by modified pilasters on an extended facade that reaches to the roof line to form a massive cornice. Pilasters on the corners and vertical indentations above the windows give the building a fortress appearance. Casement windows are elongated and rest on pre-formed concrete sills. Four garage doors provide vehicle access to the building. Reducton of the front doorway with glass panels has not impeached the essential integrity of the building. 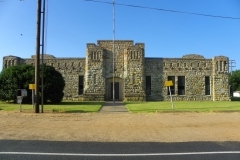 The Tishomingo Armory is notable for its scale, materials, style, workmanship, and Romanesque beauty. The high, arching side walls of the drill floor are works of art in themselves. It is to the credit of the WPA program that such a structure of permanence and beauty could be built by largely unskilled laborers who were left jobless as a result of the severe economic depression. 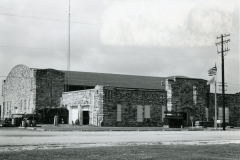 It is significant that the armory has played a part in the military activities of this country, completed just in time to help train the Oklahoma National guard for participation in World War II. VERBAL BOUNDARY DESCRIPTION: From NE corner of NW 1/4, SE 1/4 of Sec. 9, T 4 S, R 6 E , go west 230 feet, south 230 feet, east 230 feet and north 230 feet. Armory projects in Oklahoma easily met the requirement of usefulness and permanency. Oklahoma National Guard units never had permanent headquarters. Most rented make-shift facilities at a cost to the state of about $50,000 annually. Security was often a problem, leaving arms and equipment liable to theft. Tishomingo’s unit, Headquarters Company, First Battalion, 180th Infantry, occupied a space described by the local newspaper as “very poor.” It was so bad, in fact, that “as far as an armory goes, they have none.” An armory for Tishomingo would have multiple purposes. The proposed site was on the campus of Murray State College on the south edge of town. 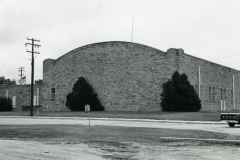 The armory could serve both the Guard and the college’s cadets as a drill site at the same time it provided facilities for “Aggie” and Tishomingo high school sports events. The Tishomingo community also needed the employment a WPA armory construction project would afford. Once the capital of the Chickasaw Nation, Tishomingo was now a small college and market town. The primarily agricultural economy was supplemented by tourism and exploitation of granite, building stone, and glass sand deposits. The droughts of the early 1930s and a national depression devastated a local economy already suffering from years of low agricultural prices. By June 1935 unemployment in Johnston County affected 1,349 heads of families or single people, translating to 43 percent of the population. A project such as the building of an armory in Tishomingo meant jobs for many men on the relief rolls. Murray State College was willing to sell its football practice field to the State of Oklahoma for the sum of one dollar if it meant a new and impressive building for the campus. By October 1935 the enthusiasm and active support of businessmen’s organizations, Guardsmen, and school officials won Tishomingo a WPA armory project. 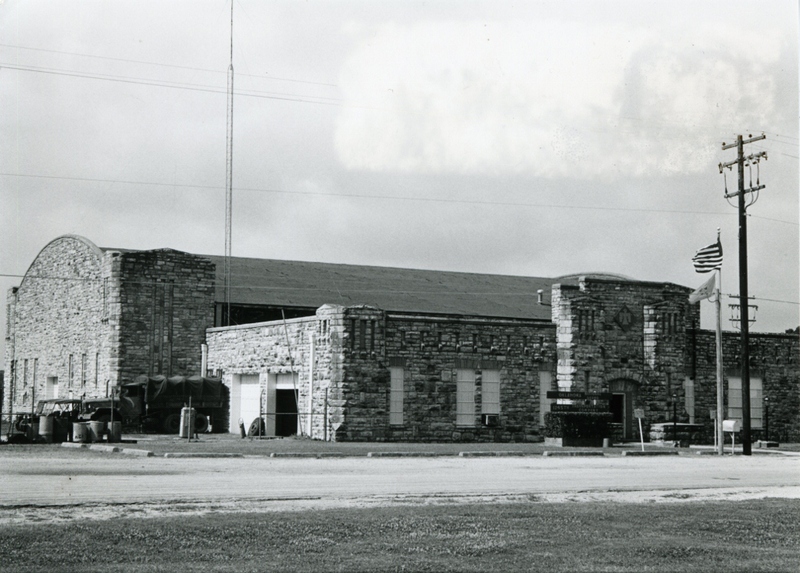 Construction of the Tishomingo Armory began the same month. The labor-intensive quarrying, dressing, and laying of the native stone as well as the cutting, sanding, and setting in place of hundreds of thousands of four-inch wooden blocks in the drill hall floor took as many men as possible off the relief rolls. These men were limited to 130 hours’ work per month but were guaranteed a wage of $23 per month. This allowed them to regain their independence and some purchasing power, further aiding the local economy. By late August 1936, WPA officials reckoned that the building was 84 percent complete. The third started in the state, it stood a good chance of being the first finished. By October a four-way race had developed with Norman, Haskell, and Kingfisher being the other contenders. The race took on added importance with President Roosevelt, creator of the New Deal and its WPA program, up for reelection. 5 Pointing to the armory building program, new bridges, farm ponds, street improvements, and sewer system, the editor of the local Democratic paper asked, “What would have happened to hundreds of impoverished Johnston County residents if the WPA had not furnished employment?”6 By late October the walls were up and the steel framing of the drill hall’s barrel roof were going up. In spite of the labor force’s best efforts, the armory was completed third behind Haskell and Kingfisher. The dedication, a celebration of and by the WPA, took place November 2, 1936, two days before the 1936 election. 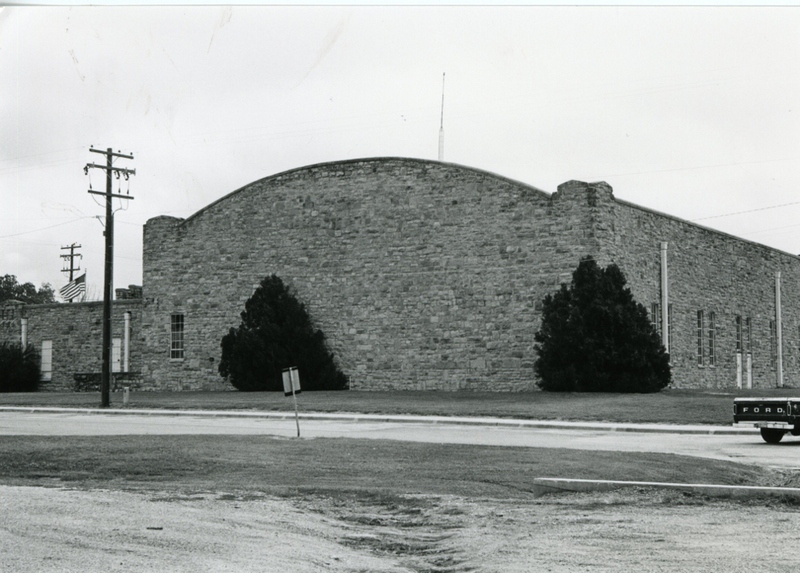 Within the next few weeks the Tishomingo Armory began to fulfill its multiple-purpose role, as an armory for the local Guard and the “Aggie” cadets as well as the site of boxing matches, basketball games, concerts, and fiddling contests. The Tishomingo Armory was completed at a cost of nearly $40,000 with $17,000 of the amount going into payroll for unskilled labor. While this was one of the smaller armories constructed under the WPA program, the drill hall at 85′ by 125′ was larger than comparable buildings in neighboring towns. At the west end of the drill hall was a stage, evidence of the multiple purposes intended for the armory. Beneath the stage was a basement rifle range. The administrative section of the building contained offices, locker rooms, storage rooms, and classrooms. It was the tenth building on campus and one of the most impressive structures in Tishomingo.